Lee Min Ho + Amber Kuo - "Today I Want To Marry You"
do आप like lee min ho behaviour in his real life या in his drama life? Do आप like Lee Min Ho? Who looks good with Lee Min Ho???? I would like info on USA प्रशंसक club please. How can i send a gift to him? Adress? 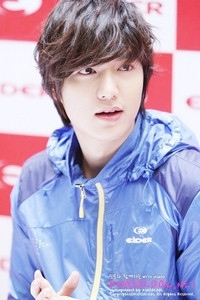 Please how I can meet lee min ho? During a हाल का interview, actor Lee Min Ho compared his real personality to the characters he played in 'Heirs' and in the upcoming movie 'Gangnam 1970'. The actor revealed that his personality is much closer to the rough-rider character in 'Gangnam 1970' than the soft and romantic Kim Tan from 'Heirs'. He said, "I am completely different than the character that I played in 'Heirs'. My real personality is और like the one in 'Gangnam 1970'. It's gotten better now, but I used to get गूसबम्प्स when I would have to do romantic या proposal scenes." * He has been quite busy lately having a hectic schedule with the various endorsements and CFs. 1.Eider-An outdoor sports clothing brand. 3.Innis free : An eco friendly brand of natural products. 5.Trugen : another clothing brand. 6.Semir :Also a clothing brand. In today's news article, LMH will visit Sydney to shoot magazine photos. on Apr. 19 in Ulsan, Korea. And leave for Sydney on Apr. 23, 4 days 3 nights. - Family: Father, Mother, Older sister. Lee Min Ho is a South Korean actor who is best known for his leading role as the leader of F4, Goo Joon Pyo, in the Korean adaptation of the लोकप्रिय मांगा series, Hana Yori Dango, titled Boys Before Flowers, in 2009.
an answer was added to this question: who is the real girlfriend of lee min ho? a question जोड़ा गया था: I would like info on USA fan club please.